In the summer of 1968, it was announced that Travilla was selected to design the gowns and nurse's uniforms to be worn by Diahann Carroll for her starring role in "Julia" debuting on NBC in the fall. 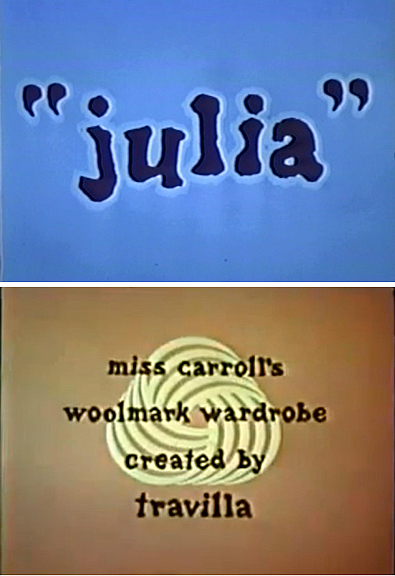 Carroll was to play Julia Baker, a young widow whose husband was killed in the Vietnam War that moves into an integrated apartment building in Los Angeles with her young son Corey. She finds employment at a local aerospace company where she is one of two nurses for a grumpy, but lovable doctor. Carroll was a veteran of Broadway, film, and numerous appearances on television variety shows so she was well known by the mostly white viewing audience. Her elegance and grace would hopefully smoothly usher in the acceptance of a television series where the lead actress was Black. Originally, producer Hal Kanter did not envision Carroll's image as matching the role of Julia Baker. He changed his mind, however, when she arrived at the interview "simple and understated" in a black wool suit with a short skirt. But the actress did let him know her preferences, later telling the press "Clothes are very important to me. When we started filming I told this to our producer Hal Kanter. And that's how Travilla stared designing for me. How lucky can a woman be? I do so enjoy wearing beautiful clothes." 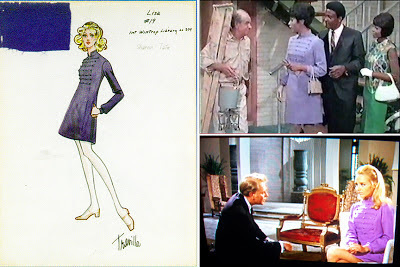 But once in production, Kanter's decision seemed to backfire as many critics felt with Carroll's sophisticated image, viewers would not believe her in the role of a nurse and mother, especially appearing in the numerous stylish outfits she did. 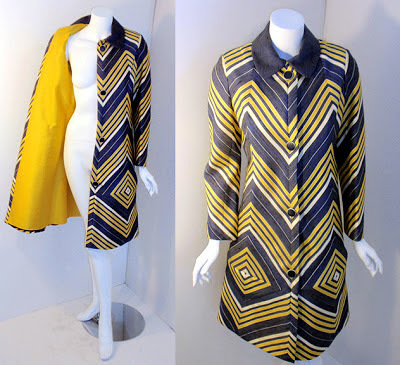 In fact, predicted before the series started that Carroll would appear on the "Best Dressed List" came true when she was honored as one of 1968's "Most Imaginative Women in Current Fashion" along with Streisand and the Baron de Tothschild among others. Six of Travilla's onscreen creations. Travilla himself spoke to the press about the issue telling them, "In the first place, Julia supposed to sew her own clothes. Scenes have been arranged showing her doing so. Anyone should know that women on a budget are sewing by the millions just in order to have elegant clothes. To think of a working-girl look for Julia a out-of-date snobishness. That's a hand-over from the Thirties. People who talk that way annoy me with their ignorance. 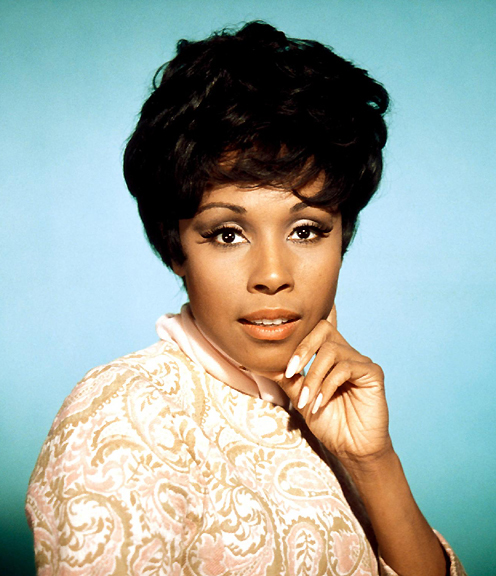 Because of that mentality, we felt we had to give Diahann Carroll a reason for being well-dressed in the series, when the truth was, she could have look just as well in regular commercial clothes." Carroll in robe mentioned below on Belgian trading card, publicity photo, actual robe. 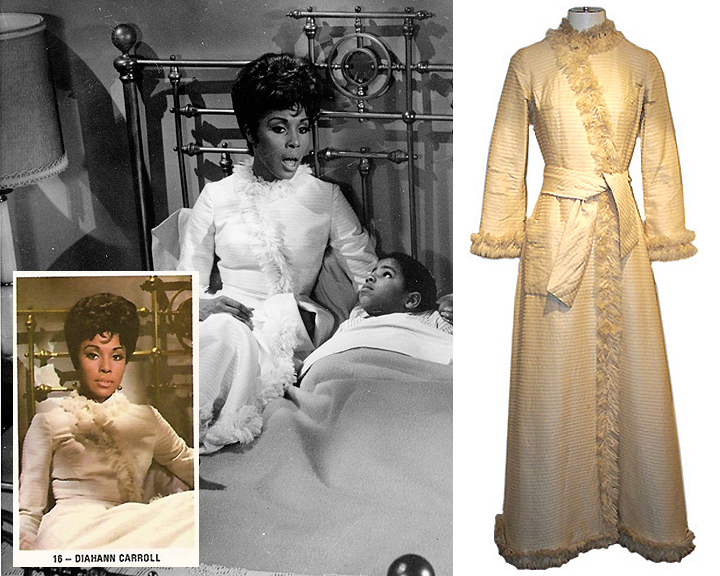 "I did a white wool fringed house-robe for Diahnn which she and the producer both thought was too luxurious looking even if Julia made it herself. When I told them a copy could have been bought for $35 to $50, it was used. There's plenty of good fashion today at low prices. 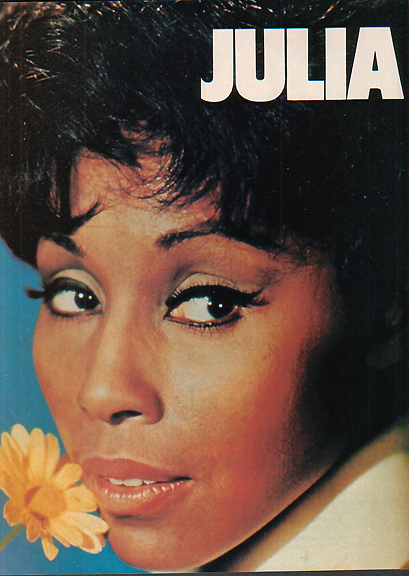 If a woman like Julia were badly dressed, it would be the fault of her taste, not a lack of clothes to be bought or made." Valley of the Dolls. 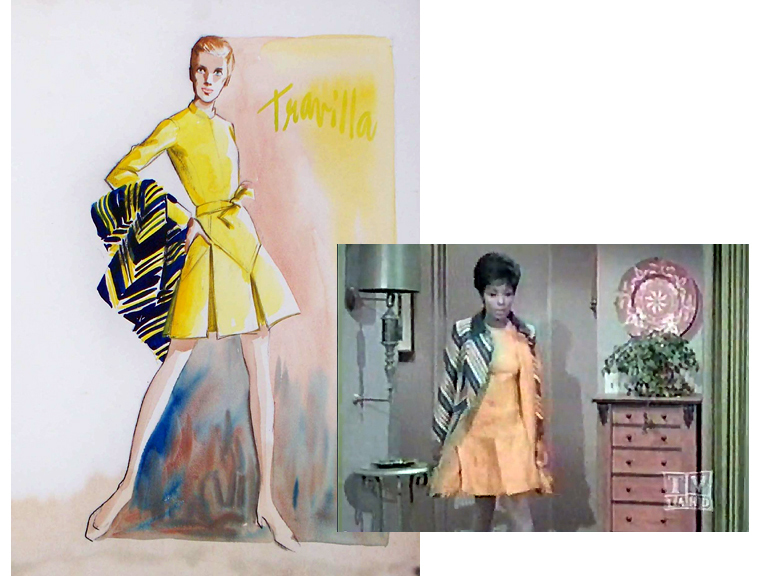 Seen here with Patty Duke in a Travilla creation. However in 1984 he told the L.A. Times "Realism on that level wasn't important -- seeing Diahann look terrific was a lot more fun." Designed for Carroll and possibly his upcoming fashion line. Closer views of Carroll wearing coat. Fabric is raw silk. Almost exact duplicate in my collection. Travilla used the same costume for Karen Mossberger in "The Big Cube" (though mis-identified as Sharon Tate) as well for an episode of "Julia." 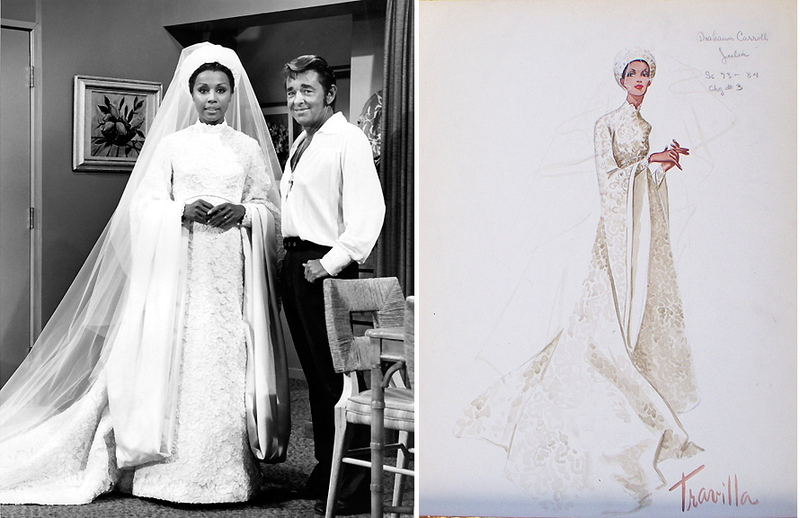 Travilla's design and Carroll in her wedding dress from show. Gown among part of collection lost to fire shortly after Travilla's death. Always ahead of the fashion trends and Carroll as a fashion leader, when the mini-skirt started creeping towards the midi, it created an issue between designer, star and producer. Hal Kanter told reporters "he would go along with anything designer Travilla dictated, 'but I'll raise the hemline two inches.'" 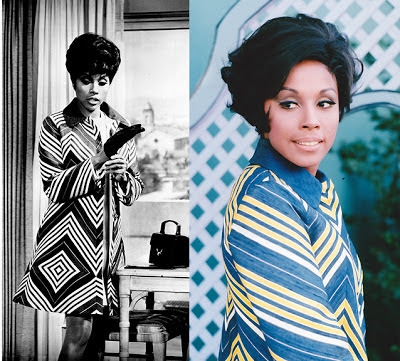 Diahann Carroll "confesses that she feels 'absolutely ridiculous' in the midi fashions she must wear for the series they're shooting now for fall in this hot, hot weather. 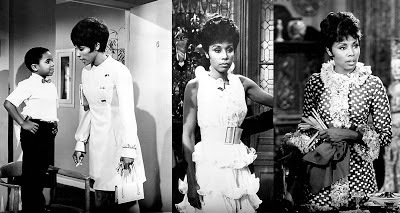 And in spite of it of Diahann's objections that she doesn't dig the long-skirt scene, desinger Bill Travilla has decreed that she has to go the midi route or look absolutely out of it." Travilla's solution was to put Carroll in pants when she's on hospital duty and to have some of her skirted uniforms cover the knee. But it soon became a mute point as the series ended in 1971. However, it was quite a productive 1968-71 for the duo's partnership that continued until Travilla's death in 1990.